The plan is to develop an open and simple procurement gateway to expedite the adoption and integration of new technologies into government service delivery. One of the areas highlighted in the consultation paper is identifying barriers to the Government’s adoption of innovative technologies. The example provided is that of cloud services, whose adoption has been slow in the public sector, in contrast with rapid uptake in the private sector. In the same year, 27% of ICT spending was for services provided by an external provider, while 26% and 14% were associated with internal personnel and external contractors respectively. The Departments of Defence, Human Services, Immigration and Border Protection, and the Australian Taxation Office accounted for 64% (around $3.6 billion) of the government’s total ICT spend of $5.6 billion. Between 2009-10 and 2014-15, 20 large vendors made up around 50% of the total value of government ICT contracts, with nearly half of this going to just five large vendors, reflecting concentration, notwithstanding the small contract size as seen from the chart above. The government is looking to increase SME (Small and Medium Enterprises) involvement to drive greater innovation in government service delivery. SMEs accounted for 31% in value of government ICT contracts in 2014-15. Currently, there are limited formal avenues for businesses to pitch ideas or offerings to agencies. To achieve the aforementioned objectives, the consultation will focus on three key areas: Rules (rules and policies in place that direct how procurement occurs in government), Capability (capability, knowledge and skills of the public sector and how this capability may affect ICT procurement outcomes) and Culture, referring to unwritten practices like attitudes, habits, values, biases, and beliefs (industry or external experience of government culture, and how this might be improved). The paper outline three tiers of rules that guide the procurement decisions of Australian Government, the first two tiers being mandatory for all agencies and universally applying to all forms of procurement, and not just ICT. The first tier rules are sourced from the Commonwealth Resource Management Framework and the Commonwealth Procurement Framework. The second tier is the Protective Security Policy Framework. The third tier of rules consists of ICT-specific or universally applicable, agency-specific policies and guidelines that interpret the central rules and provide practical advice to officials on how procurement should be conducted. The agency-specific rules, while necessary for customisation according to business needs and risk appetite, can consume additional time and resources for vendors. The paper also talks about other legislation, that guide the actions of government officials, such as the Public Service Act 1999 and the Crimes Act 1914, which deal with ethics and conflicts of interest. The taskforce also intends to look at the approach of ICT panels, introduced in 2008, wherein an initial approach to market is made and suppliers selected, after which procurement from selected panel suppliers can be made directly. It is estimated that in 2015-16, Nearly 30% of government ICT contracts by value were procured through panel arrangements, resulting in savings of over $1.2 billion, through streamlining of the procurement process. At the moment, there are 70 ICT and engineering services panels, some of them specific to agencies and some at a whole-of-government level and purchase of certain ICT solutions such as telecommunications, end-user hardware and data centres, is mandatorily through seven whole-of-government panels. The downside is that getting onto panels may impose barriers to the participation of large number of vendors, particularly SMEs, by imposing heavy time and cost requirements and demanding certifications or indemnities. Thirteen questions are listed down to prompt and direct thinking. Submissions are sought till 31 January 2017. 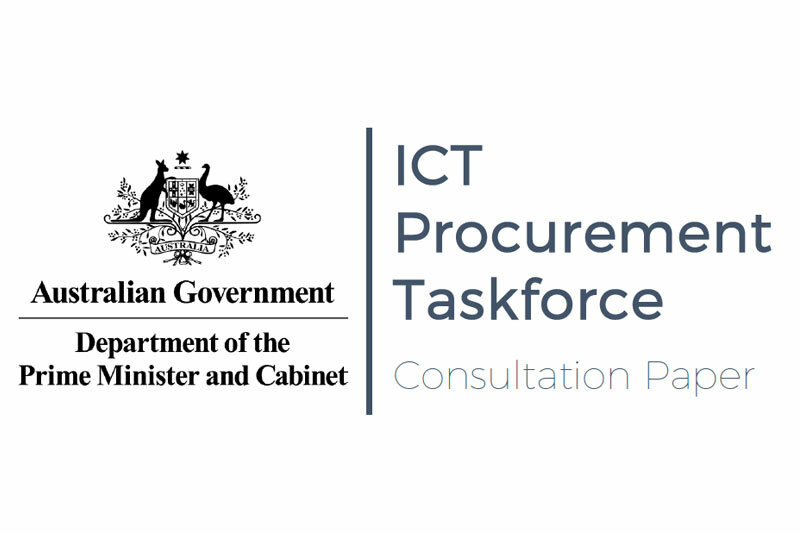 The ICT Procurement Taskforce will provide a report to the Government in early 2017.